I’m in the planning stages for a series of 25 Flash Podcasts, “Things We Wish Jesus Hadn’t Said,” to highlight some of the grimmer, weirder sayings attributed to Jesus. These all come from the four gospels fashioned by writers well after his time, perhaps a half-century or more; hence safe attribution to Jesus of any of these sayings cannot be assumed. Figuring out what Jesus of Nazareth actually taught is largely guesswork, hence different scholars depict him in such different ways. But the oldest document in the New Testament is contemporaneous with a Bible character—because he wrote it himself. So we have his authentic words, to the extent that scribes got the text right during the centuries of copying by hand. The consensus of NT scholars is that the apostle Paul is the author of what we call the First Letter to the Thessalonians. Second Thessalonians is considered a forgery, but never mind: The first letter is enough to demonstrate Paul’s weak grasp of reality. So, pay attention, Christians: this letter is a glimpse of the faith as it was early on. Is it really what you want? This is another of my articles in a series on each of the five chapters of First Thessalonians, this one on Chapter Four. Here are the others so far: Chapters one, two, and three. Where do strange preachers get their strange ideas? Paul brags in his letter to the Galatians that his certainties about Christ came from visions, directly from Jesus himself. How would you regard your next-door neighbor who made such a claim? People of faith who say, “Oh, Yes, visions are real,” must tell us where they draw the line. 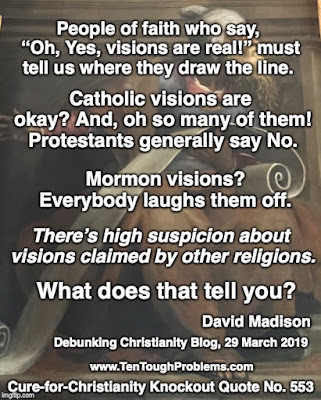 Catholic visions are okay? And, oh so many of them! Protestants generally say No. Mormon visions? Everybody laughs them off. 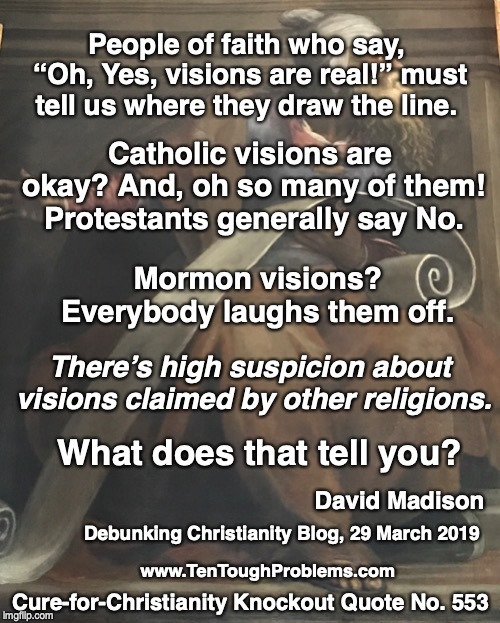 There’s high suspicion about visions claimed by other religions. What does that tell you? Today we acknowledge that Paul hallucinated that a dead man talked to him. And who knows what mix of imagery and fantasies seeped into his mind from the religious milieu at the time. I Thessalonians 4 demonstrates how wild his imagination could be. In the next two verses he elaborates: “…that each one of you know how to control your own body in holiness and honor, not with lustful passion, like the Gentiles who do not know God.” How about that! Christians were not supposed to yield to lustful passions; achieving this would be clue they were better than Gentiles who don’t know God. And there were consequences: “…the Lord is an avenger in all these things, just as we have already told you beforehand and solemnly warned you. For God did not call us to impurity but in holiness.” For Paul, lustful passion = impurity. Hmmm…the last time I checked, ‘lustful passion’ is a normal, healthy part of being human, and I’m sure many Christians would agree. But Paul assumes that the avenging Lord won’t stand for it. After all, Paul once advised that it is better “not to touch a woman.” Can we infer that Paul was a pretty sour person to be around? This is a glimpse of the faith as it was early on. Is it really what you want? Now, here’s a surprise: in “know how to control your own body” the Greek word for body is skeous, whose basic meaning is vessel, which indeed is the rendering in the King James Version. But some translators have wondered if this might be a metaphor for wife, hence in a footnote the New RSV offers an alternate translation: “how to take a wife for himself.” For those who want to dampen the misogyny of the Bible, it would be best to ignore the metaphor (vessel = wife) and go with vessel/body literally. We hear so often about the ‘God of love’ in the New Testament—as opposed to the OT—but this is a fallacy. Paul was convinced that wrath was God’s default emotion, hence it’s no surprise that he would warn his readers that ‘the Lord is an avenger.’ And ‘being in Christ’ was the only the way to escape the wrath. But notice the catch: “…nor anything else in all creation, will be able to separate us from the love of God in Christ Jesus our Lord.” You have to be in Paul’s cult to get in on the deal, to be guaranteed that nothing will separate you from God’s love. Paul makes this especially clear in Romans 10:9: “…if you confess with your lips that Jesus is Lord and believe in your heart that God raised him from the dead, you will be saved.” That’s the key for escaping God’s wrath; his love is not a general ‘thing’ bestowed on all humanity. Paul was dead wrong, of course; he expected this event soon: “We who are alive, who are left, will be caught up in the clouds...” Paul even had the stage directions worked out. Jesus would utter a cry of command from high up in the sky; an archangel would call out as well, with musical accompaniment, “the sound of God’s trumpet.” And how dramatic: the dead in Christ would rise first, then everyone else too would “meet Jesus in the air.” And be with him forever. Paul missed his calling by about thousand years: he could have written stories for supermarket tabloids. As could the author of Matthew’s gospel, who reported that dead people came out of their tombs and wandered around Jerusalem on Resurrection Morning. I Thessalonians 4 is one of those chapters that Christians might pull their pastors aside to whisper, “Hey, Rev, this Bible chapter is really freaking me out.” If they are grounded in reality and have a pretty good grasp of how the world works. Only the evangelical types who yearn for The Rapture—predicted by this text—still think that Paul, a prototype of the delusional cult fanatic, is cool. Sure, we can shrug off talking snakes and donkeys, and dozens of other Bible fables. Good clean fun, I suppose. But I Thessalonians is core Christianity, as it was in the beginning. This is one of the charter documents of the faith, from the pen of one of the giant founding heroes. As an atheist, I can laugh it off as a superb example of religious aberration—as it surely is. How can it not be a colossal nuisance for Christians who want to pretend that their faith has not been falsified? David Madison was a pastor in the Methodist Church for nine years, and has a PhD in Biblical Studies from Boston University. His book, Ten Tough Problems in Christian Thought and Belief: a Minister-Turned-Atheist Shows Why You Should Ditch the Faith, was reissued last year by Tellectual Press, with a new Foreword by John Loftus.